A visit to LASP is similar to touring an aerospace museum. 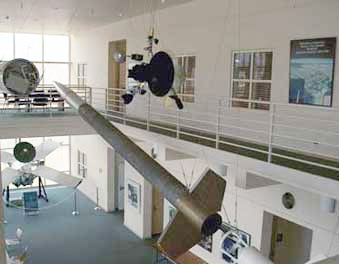 Hanging from the ceiling of the lobby is a 26-foot Aerobee 150 sounding rocket along with many other interesting spacecraft and historical objects. Visitors can view models of different spacecraft and satellites, a class-10,000 clean room, a machine shop for building instruments, and our Mission Operations Center from which we operate satellites. While LASP does not have regularly scheduled tours and cannot accept requests for tours from individuals, we can arrange tours for private groups of 10 to 40 guests. Tours are held during normal business hours (M–F; 8 a.m.–5 p.m.) and last approximately one hour. Due to volunteer staffing requirements, three weeks advance notice is requested for tour requests. To schedule a tour, contact LASP Education & Outreach at epomail@lasp.colorado.edu.